In this session we will zoom in on the biopolymers, harvest out of the WTTP. Two different processing routes are highlighted. One leading to Polyhydroxyalkanoate (PHA) and one leading to alginate-like exopolyssacharides (ALE). We will also address the applicability of these polymers for products and how these products contributes to the circular economy. After presenting these examples we will initiate an interactive discussion on if, how and where we could implement these expertise at other WTTP. The substance responsible for the granular growth of micro-organisms in aerobic granular sludge Nereda®) is a biopolymer termed ‘alginate-like exopolysaccharides’ (ALE).This new material has many unique features and offers various potentially high-quality applications. By extracting this, water authorities are taking concrete steps towards achieving a circular economy. Various market parties have already shown interest in using the ALE. It is a durable material with a number of unique features. It can function as a water repellent coating, it can thicken or gel liquids or it can be used as a binding agent for several composite applications. Since 2014 the Nereda® ALE Development Program (NAOP) has carried out intensive research into the production, extraction and use of ALE. 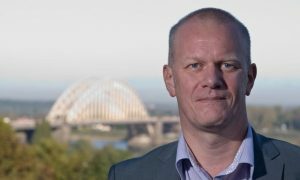 Paul Roeleveld is a Leading Professional at Royal HaskoningDHV in the field of wastewater treatment and resource recovery. He has more than 25 years of experience, mainly in the market of municipal wastewater treatment and sludge treatment processes. Key qualification is bringing innovations from science to practice. Innovation themes in which he is recently active are finding better solutions for sludge treatment, improve the removal efficiency for micropollutants and making the shift from wastewater treatment to resource recovery. Polyhydroxyalkanoates (PHA) are biodegradable biopolymers with similar properties to oil-based polymers like polypropylene and polyethylene produced by microbes. Paques and the PHARIO consortium (composed mainly by Dutch water authorities) have two different technologies for PHA production from wastewater and/or organic waste using mixed culture technology. Even though both technologies have been successfully shown at pilot scale, such scale is not enough to yield the amounts of PHA required by companies that want to use PHA in their products. To tackle this mismatch, a demonstration project for the 2 technologies is essential, which will enable the production of higher amounts of PHA to develop the PHA application market. However, such step come with its own challenge! 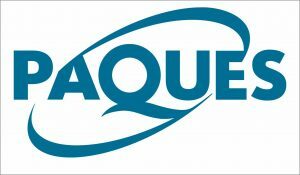 Dr. João Sousa is the Head of Emerging Technologies at Paques BV, a company focused on technologies for resource recovery from wastewater. He is responsible for scouting and developing new technologies connected to the production of new bio-based products, with a strong focus on short and medium chain fatty acids and biopolymers (PHA). Wastewater treatment technologies have traditionally addressed methods and process for reliably meeting discharge water quality objectives. A pedigree of research and development up to pilot scale has shown that PHA production can become an integral part of existing organic waste management function. This duality in function relates to addressing ongoing demands for environmental protection and, at the same time, reaching targets in economy and quality of renewable polymer products. As with any factory, raw materials enter, products exit, and residual streams must be managed. The factory requires a predictable economy in its operation and performance, and the products should be a dependable raw material supply for the biobased economy. The recently formed “Biopolymers from water theme” at Wetsus is geared to address these challenges in anticipation to help that successful demonstration scale work will lead smoothly to full scale reference factories. Alan is an professional engineer with 30 years of experience in academic and industrial research and development efforts in bioprocess engineering and materials science (PhD Environmental Engineering, University of British Columbia). For the past 16 years, he has driven and managed developments focused on the devil in the detail from fundamental know-how to piloting proof of concept of producing biopolymers from residuals management services. 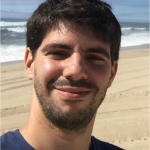 Alan has engaged in national and international academic, corporate, and public/private collaborations in basic research, thesis supervision, EU Projects, and, as well, business development challenges towards establishing bio-based value-added chains from renewable resources. He is a Canadian turned Swedish, an entrepreneur with Promiko AB, the theme leader for the Wetsus Biopolymers from water theme, and adjunct Professor with the School of Chemical Engineering, at the University of Queensland. Originally Dutch, holds a BSc in Public Management and has lived in several different countries and cultures. He has a great passion for ecology, nature and sustainable living. 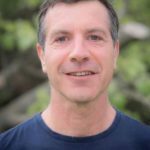 He has studied Permaculture Design and Ecovillage Design Education in which he has gained both knowledge and hands on skills in gardening, sustainability, carpentry and natural building. 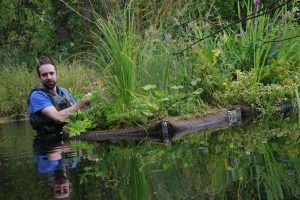 Now at Biomatrix he brings his passion, experience and knowledge to practice in order to make a positive environmental impact. Biomatrix Water provides solutions in ecological water management from wastewater treatment to restoration of degraded waterways and -bodies. Biomatrix Modular Floating Ecosystem helps to restore the riparian edges, provide wildlife habitat, restores the ecological balance, enhances the water quality and adds aesthetic & amenity value. By integrating bio-plastics on our Modular Floating Ecosystems moving further to a sustainable and circular economy. Using bio-plastics to provide urban green spaces, adding biodiversity and cleaner and healthier water.